In large bowl, beat Coconut Frozen Yogurt ingredients until combined. Process in ice cream maker according to manufacturer’s directions. Scrape churned frozen yogurt into freezer-safe container with lid. Freeze about 6 hours or overnight until solid. 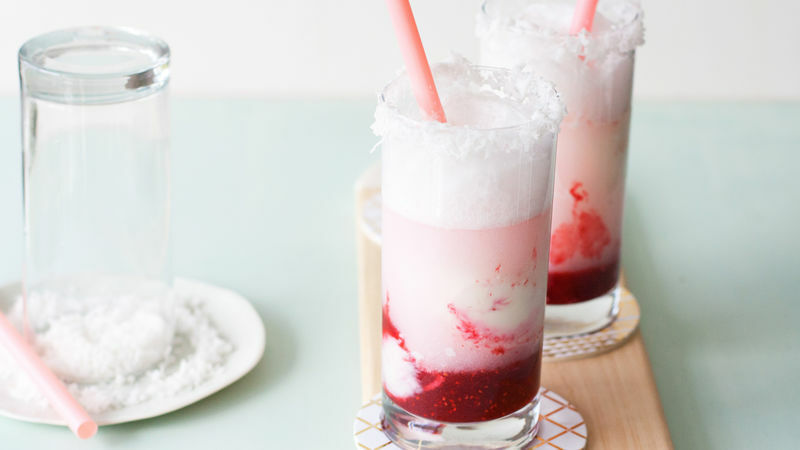 To make Floats, layer a few tablespoons raspberry syrup in each tall glass. Add few scoops of coconut frozen yogurt to each. Top each with sparkling water. Leave the layers as is for a pretty presentation, or stir together. Add drinking straws, if desired. This recipe is super easy. Most of the time comes from freezing the yogurt. To add even more flavor, you could use raspberry or coconut sparkling water instead of plain, if you’d like. To make a coconut rim for the glasses, simply wet the rims of each glass with lemon juice or water and dip into finely grated coconut.